The widespread view of Neanderthals as cognitively inferior to early modern humans is challenged by new research from the University of Bristol published in Proceedings of the National Academy of Sciences. Professor Zilhão said: "This is the first secure evidence that, some 50,000 years ago – ten millennia before modern humans are first recorded in Europe – the behaviour of Neanderthals was symbolically organised." A Spondylus gaederopus shell from the same site contained residues of a reddish pigmentatious mass made of lepidocrocite mixed with ground bits of hematite and pyrite (which, when fresh, have a brilliant black, reflective appearance), suggesting the kind of inclusion 'for effect' that one would expect in a cosmetic preparation. For example, controversy has surrounded the perforated and grooved teeth and decorated bone awls found in the Châtelperronian culture of France. In earlier work, Professor Zilhão and colleagues have argued they are genuine Neanderthal artefacts which demonstrate the independent evolution of advanced cognition in the Neanderthal lineage. However, the Châtelperronian evidence dates from 40,000 to 45,000 years ago, thus overlapping with the period when anatomically modern human people began to disperse into Europe (between 40,000 and 42,000 years ago) and leaving open the possibility that these symbolic artifacts relate, in fact, to them. Professor Zilhão said: "The evidence from the Murcian sites removes the last clouds of uncertainty concerning the modernity of the behaviour and cognition of the last Neanderthals and, by implication, shows that there is no reason any more to continue to question the Neanderthal authorship of the symbolic artefacts of the Châtelperronian culture. "When considering the nature of the cultural and genetic exchanges that occurred between Neanderthals and modern humans at the time of contact in Europe, we should recognise that identical levels of cultural achievement had been reached by both sides." Dr Thomas Higham, Deputy Director of the Radiocarbon Unit in the School of Archaeology said: "Dating samples that approach the limit of the technique, at around 55,000 years before present, is a huge challenge. 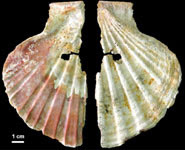 We used the most refined methods of pre-treatment chemistry to obtain accurate dates for the sites involved by removing small amounts of more modern carbon contamination to discover that the shells and charcoal samples were as early as 50,000 years ago."